This dish will remind you a bit of the often-served green bean casserole of Thanksgiving, but with far more flavor. If you can’t stand that particular recipe, please don’t turn up your nose at this dish. Everyone I have served it to has swooned over the richness and the flavors. You will too! When you make this recipe, you might want to double it so you have some very welcome leftovers. Oh yes, and you will probably eat up the scrapings from the bottom of the serving bowl. Don’t be embarrassed. You will not be the first to do so. Is this “green bean heaven”? Absolutely! 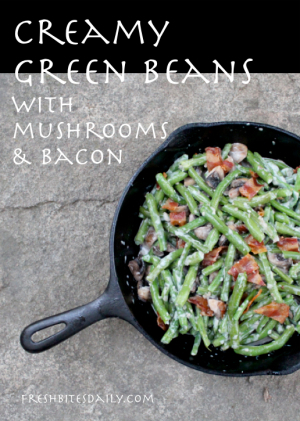 This recipe is a showcase for fresh green beans, though frozen green beans are acceptable. Don’t even bother if the beans are canned. I admit a bias here, a heavy one. Go with the fresh fillet-type beans and you can’t miss with this recipe. Heat the butter and bacon fat in a large heavy skillet. Add the minced garlic and stir for about 30 seconds. Toss in the sliced mushrooms and continue stirring to completely coat the mushroom slices with the garlic oil. Cook until the mushrooms begin to release their liquid. Remove the mushrooms to a small bowl. In the hot skillet, replace the mushrooms with the green beans. Keep stirring to coat the beans. Salt and pepper the beans and continue to stir. You are aiming for tender-crisp beans. What better way to check than to eat a few? Go ahead. You’re the boss. Depending on the bean you are using, this cook time will probably be only be two or three minutes. As soon as the beans reach perfection, return the mushrooms to the skillet. Marry the beans and mushrooms together gently and then pour on the cream. Cook over medium heat for about two more minutes. The cream will begin to thicken a bit. Sprinkle on the broken bacon and Parmesan cheese. Toss and serve hot. One of my favorite ways to enjoy these beans is over top of half a baked potato that has been split open and lightly buttered. This is not diet food, of course but it is the most splendid of comfort foods.